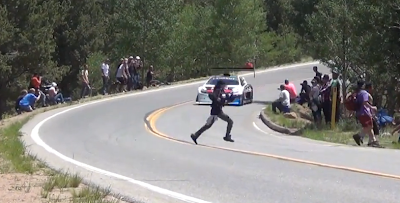 So, Sebastien Loeb is pushing as much as he can while trying to set a new record at Pikes Peak, you hear him coming behind the corner, so what you decide to do? You cross the street... like an utter idiot, of course. With a countless amount of victories and nine consecutives (!) victories of WRC, Sebastien Loeb is already a living legend, and he won't stop to collect records. His latest is one is the remarkable lap time of 8′13″878 with a new record set at Pikes Peak.. 93 seconds faster than the previous record! Loeb is undoubtely badass, did you see the onboard in his Peugeot 208 T16? That's badass too, so enjoy it until the end.